My son Kevin is 30 years old. His older brother Jason is 32. We all joined HSP in early 2007. Both of them are floating guest members. All three of us were on this hunt. We had scouted this property a couple of different times and as a group we were convinced the best time to hunt this farm was on a late afternoon. So after battling icy roads to get there, the hunt began. The three of us had just started deer hunting 5 years ago. After joining HSP, all of us knew we had increased our chances of seeing and harvesting big deer. Right now it's about harvesting deer, but I'm sure that will grow into trophy pursuits. Being lifelong upland hunters, we have really enjoyed the transition to deer hunting. 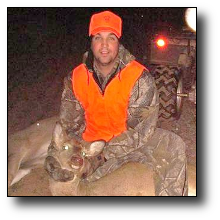 Kevin shot his doe (the 2nd of his life) with a 30/06 rifle from approximately 60 yards. He and Jason lie down along the edge of a CRP field that butted up to a winter wheat field. The group of 4 does just kept feeding and moving closer until Kevin took the shot. Jason shot his first deer of his life not 30 minutes later in almost the same spot. Jason hopes to take his 16 year old son in the near future and try to get him his first deer. HSP has given us the opportunity to pursue new game and to hunt on absolutely great properties. Special thanks go to Angie, for helping us select this property.